Democrats cast ballots on Sunday to choose delegates for Hillary Clinton. At caucuses throughout the state on Sunday, California Democrats elected many of the delegates who will travel to the party’s national convention and officially choose a presidential candidate. 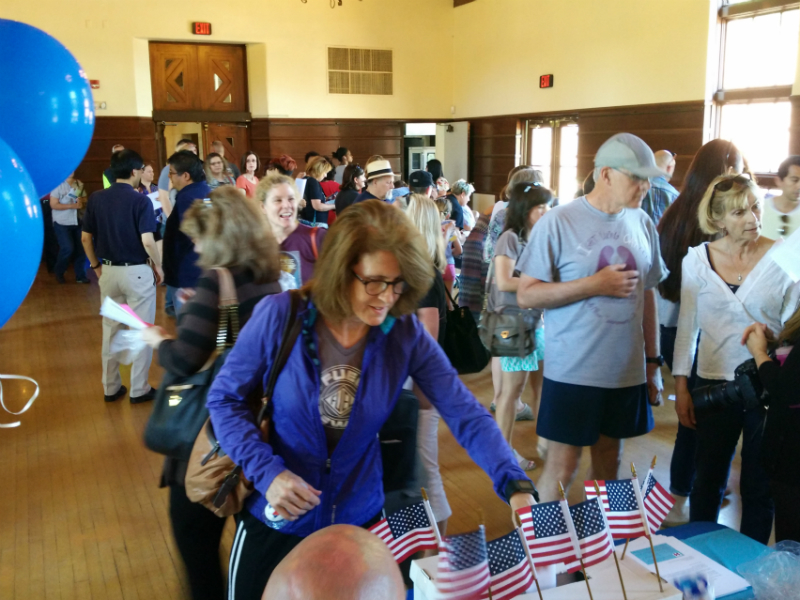 In Sacramento, the line stretched out the door at a local community center. More than 500 registered Democrats showed up to select six delegates and one alternate. The candidates handed out flyers and lobbied for votes. Long-time state Capitol staffer Irwin Nowack waited for his turn to vote. "I know some of the people running for delegate, so I decided as a favor to them to do it," Nowack said. "But I didn’t think the line was going to be this bad." The line might’ve been long, but this is still an under-the-radar election—most of the attendees are politically connected. Karen Skelton, a Sacramento political consultant was running again, after serving as a delegate in 2008. "This is huge compared to last time," she said. Skelton received 275 votes, the most of any candidate. "We made speeches, we made phone calls, we did a lot of e-mails, social media, a ton of social media," she said. "So we ran it like it was a real election." Delegate candidates also looked for support from family and friends and made one-minute speeches at the local caucuses. The June primary will decide how many of the winning delegates for each candidate go to the convention. There, they will have to vote for the candidate to whom they are pledged. "To be a spokesperson for the candidate they represent and try to get everybody in their life involved as politically as possible," she said. Democrats chose about 60 percent of their state delegates on Sunday, apportioned by Congressional district. The other 40 percent are selected by party leaders. Copyright 2016 Capital Public Radio. To see more election coverage, visit http://www.CapRadio.org/.